...a fantastic investment or purchase. And it is more than worth to mention that Damai Citra is the last landed property for sale in Alam Damai. Double Story Terrace Taman Citra hill, Aria Park, Pajam Nilai. Taman Citra Hill. Fre. Want to sale! 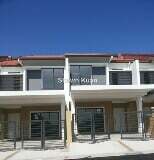 Double Storey Corner Lot Taman Bukit Citra Citra Hills Nilai Negeri Sembilan(Z.